The 16 remaining staff at collapsed wave power company Pelamis are to be made redundant after no final offers were made for the business. The firm went into administration last month. Highlands and Islands Enterprise has been selected as the preferred bidder to take over the assets of the company. But administrators KMPG said they had been unable to sell the business as a going concern, so the remaining staff will now lose their jobs. Edinburgh-based Pelamis Wave Power had employed more than 50 staff in the design, manufacture and operation of wave energy converters which it had been testing at the European Marine Energy Centre (EMEC) in Orkney. Administrators were called in after Pelamis failed to secure enough funding to develop its technology. The majority of Pelamis employees were made redundant following the joint administrators' appointment. Administrators found the best option was to sell the assets to the government. That suggests a lack of other options. Now, the challenge taken on by the Scottish government, its agencies, and the Wave Power Forum it set up when Pelamis went into administration, is to find a way to make use of the invention. The aim is to stop it becoming another technology lost to foreign competitors. The Scottish government announced it was establishing a public innovation company Wave Energy Scotland following Pelamis' demise and pledged to offer job opportunities for some of its staff. Highlands and Islands Enterprise is responsible for setting up the new body and delivering on its remit. Blair Nimmo, joint administrator and head of restructuring at KPMG in Scotland, said: "Following the sales process, I am pleased to confirm that Highland and Islands Enterprise has been appointed preferred bidder in relation to acquiring the assets of Pelamis Wave Power Limited. "Over the coming days we will be working to finalise the sale and are hopeful that the transaction can be concluded in the near future. "Unfortunately, as no going concern solution has been found, the remaining staff will shortly be made redundant. We are working with government agencies to ensure employees obtain as much assistance as possible." A Scottish government spokeswoman said: "We are very pleased that Wave Energy Scotland has been named by KPMG as the preferred bidder for some of the assets of Pelamis Wave Power. "It was always our aim to retain the intellectual property from device development in Scotland for future benefit. "The HIE team delivering Wave Energy Scotland is now engaging with KPMG to complete the purchase." 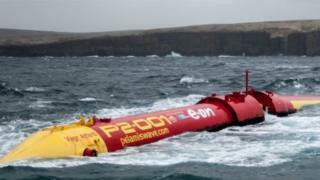 She added: "Scotland is determined to remain at the forefront of wave power innovation. "We are delighted that these valuable intellectual assets will remain in Scotland and form the foundation of Wave Energy Scotland's programme." WWF Scotland director Lang Banks said: "It really is a great pity to see Pelamis Wave Power close and staff lose their jobs. "Marine renewables have the potential to play an important role in our future energy mix, helping to cut climate emissions and create jobs around our coastline. "Successfully harnessing the power of the waves is a challenge we must rise to if we're to end our addiction with polluting fossil fuels."